As the title says, I am looking to sell various cards from the Berserk TCG by Konami. I do have extras from all sets if anyone is interested in singles. Those are some sick cards man. Do they still sell booster boxes of these somewhere? They are a little tricky to find now. You can find Volume 2 boxes floating around (and maybe a few Volume 1 boxes), but that's about it. I don't remember the last time I saw a Volume 4 or 5 box. Been a few years. Of course you have to realize that the last Volume was released back in 2005. That's been 5 years now. I did find that Nippon Export still has some Volume 2 Booster boxes in stock (no surprise there) and Volume 3 Booster boxes. However, they are VERY expensive. There is a japanese seller on eBay (poly_100) that has a few Volume 2 Boxes available for a cheaper price. Honestly, I have been looking for places that have sealed Volume 4 and 5 boosters. Any help there would be greatly appreciated. Thanks for the info!! Those illustration cards are beautiful. I'm tempted to buy a box and some of your illustration cards. Ill see how much tip money I have at the end of the month. I sold most of the Illustration cards (from the first post) already. However, they are nice looking. Smaller versions of the box toppers for Volumes 2 and 3. They are just incredibly hard to pull. Completely random. You could go through hundreds of packs (and I have) and not pull a one. I'm honestly unsure of the list for all of them either. To the best of my knowledge, there are 36 different Secret Illustration rares. For each rare, there is a corresponding holo. So needless to say, collecting that particular subset is difficult. At the height of my collection, I had maybe 12 Normal Secret rares and 3-4 holo Secret rares. You literally feel like you have hit the lottery when you pull a holo Secret rare. I'm interested in how they look. Got any pictures? You literally feel like you have hit the lottery when you pull a holo Secret rare. I bought 15 packs on Ebay and got a Zodd Holo Secret Illustration, I didn't realize they were so rare. Would you mind showing it off? I'd love to see it. HAHA that's a sweet avatar man. That is good luck indeed. Which volume packs? The black guts card is a promo card from the Volume 1 starter packs. They are all about postcard size (the starter pack promos are slightly larger). Um I don't know I bought 7 packs from vol.4 and 8 from vol.5. But it's the one where Zodd is wielding 2 swords. Ah, I know which illustration you are referring to. Should be the same as the Volume 4 64/80 Zodd rare card. From what I have gathered, the Secret Illustration cards use illustrations only from the rare cards. BTW, what number is that Zodd card? I'm guessing between 23 - 29. Thanks for the cards Tirade, they look gorgeous, and this is the first set of trading cards I've purchased, ever. Awesome! They are amazing cards to look at. The only drawback is the size. I still have quite a few cards left. Not many holos, but a fair amount of rares and commons/uncommons. I have more cards, Vol 1 - 5, available. I also have more Secret Rare Illustration Cards (Holo and Non-Holo). Finally, I do have a Kentarou Miura Illustration Art Autographed Casca card available for sale. I will add some pictures of the Secret Rares and the Auto card. In addition, I will update what cards are available. I have more cards, Vol 1 - 5, available. I also have more Secret Rare Illustration Cards (Holo and Non-Holo). Finally, I do have a Kentarou Miara Illustration Art Autographed Casca card available for sale. I will some pictures of the Secret Rares and the Auto card. In addition, I will update what cards are available. Hey, yeah please post some pictures. Depending on the picture. I might buy a holo or two. And that signed Casca card too! 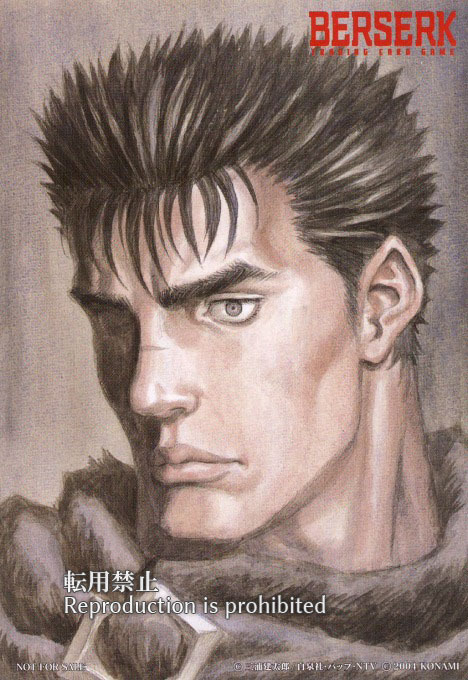 The question I have for you is this: do you have a favorite Berserk character? There are literally hundreds of cards in each set (commons, uncommons, rares and holo rares). Thus there is a lot of artwork. That artwork includes single characters and action scenes as well. So it might help if you are looking for a certain character or scene. The artwork extends into Volume 27 or Volume 28 of the manga. So anything up to that is fair game for what you might find on these cards. I could take pictures of random holos, but that could be time consuming. I'd rather post stuff I think you might like. The last image is a picture showing the Konami stamp. Doesn't photograph the best (although my lighting is terrible). Easier to see in person. Don't be taking mah cards!!!! If you asked that with any other series I could probably give you an answer. I really need to get in on this trading card business...they look awesome. Yeah, they are awesome. It is a shame the TCG fizzled out after 5 Volumes. I suspect most people were collecting, rather than playing the game. And even then, there wasn't a big demand back in 2004-2005. I should also add, a good deal of this site's avatars actually come from the TCG. My avatar, for example, comes straight from Volume 2 #64. The artwork is identical. So for those wondering, that gives you an idea of what to look for. Just search through the site's avatars. You can find them in the Personalized Pictures part of your profile. To be honest I think we're already lucky to have had 5 volumes. Konami was almost rash in its releases at the time (maybe they were under contract?). Anyway, I think the game itself is pretty cool. Konami was definitely ambitious, releasing 5 Volumes in a matter of 2 years. That is a quick release schedule for any TCG. Probably didn't help that they overproduced in regards to Volumes 2 and 3. They couldn't give those Volumes away. The market was full of Volume 2 and 3 Booster Boxes. I remember that. Thanks for posting the link, Aaz. I knew I remembered you creating a topic for it years ago. I just forgot to search for it. Definitely saves me the time of having to snap a picture of every card. That has link has a fair amount of artwork on it. That probably covers about 1/3 of all the art. EDIT: As the day goes on, I will be adding pictures to the first post in this thread. Those pictures will show Rares and Super Rares that are for sale. If you would like pictures of Common/Uncommon character cards, please ask. Good artwork is not limited to the Rare cards. By the way, how did you come across a signed card? That's incredible! What kind of condition are the cards in? I think I'd like to buy some of your commons/uncommons.